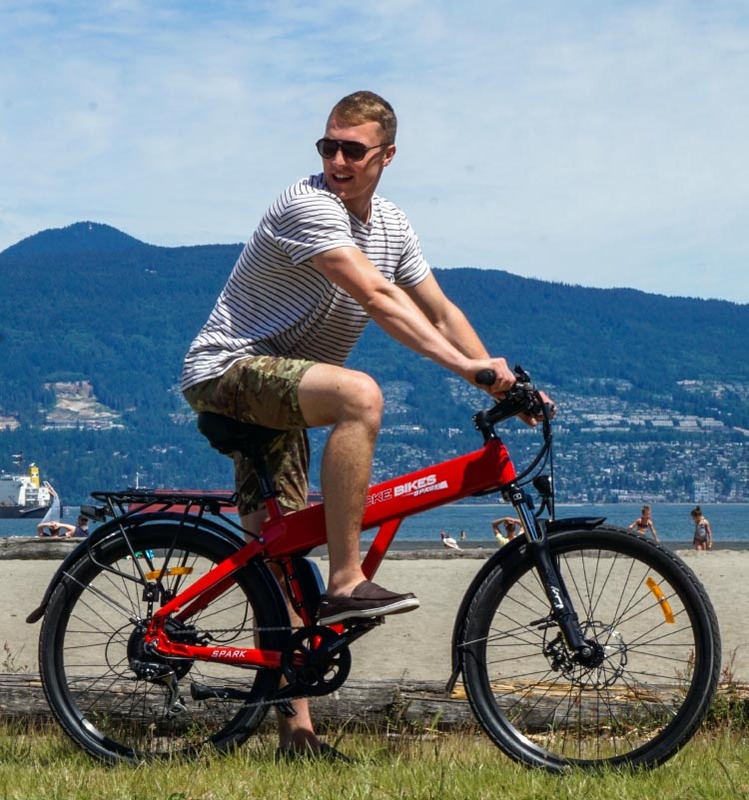 This is a review of the Spark e-bike from Shocke Bikes, which was the first in this Canadian-based manufacturer’s line-up of high quality, affordable electric bikes. I give top marks to this bike, because it rides like a bike, yet also offers smooth, cadence-based Pedelec electric assistance, plus throttle power for those awkward uphill pull-offs and for getting ahead of traffic. My first impression of this electric bike was that it was good looking and not too big. Some electric bike just look enormous, and I don’t want to stand out in the bike lane for having an over-sized bike. I don’t mind standing out for having a good looking bike, and this bike does look good – without looking flashy. My second impression was that the Spark e-bike was not too heavy – I could easily pick it up. It actually weighs in at 48.5 pounds including the battery, which is a respectable weight for an electric bike. Closer inspection showed that the Spark electric bike has quality components all around. Really surprising at this price point (around US $1.7 K). This is really good news for consumers wanting a good quality electric bike at well under two grand. Components on the Spark e-bike include SR Suntour shocks in the front, which really make the bike more useful, as you can go off road and still be comfortable. 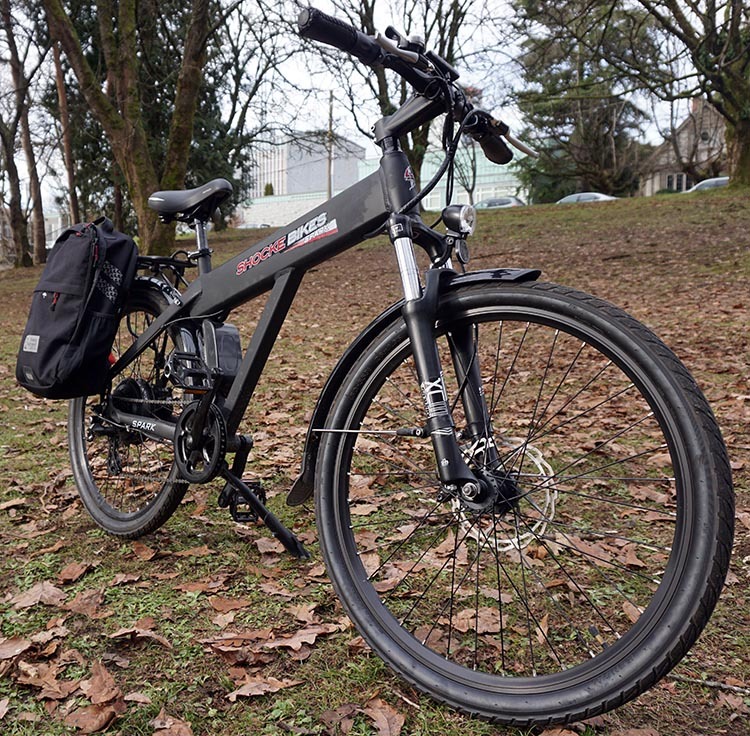 Components on this e-bike include SR Suntour shocks in the front, which really make this electric bike more useful, as you can go off road and still be comfortable. I have to say that I had a blast testing this e-bike off-road. I’ve given it back now, and I really miss those off-road bike rides with those bouncy shocks! The bike also features Shimano components, with 7 Shimano Altus gears that you control with your right thumb. The e-bike has an all-terrain frame fashioned out of military-grade aluminum. 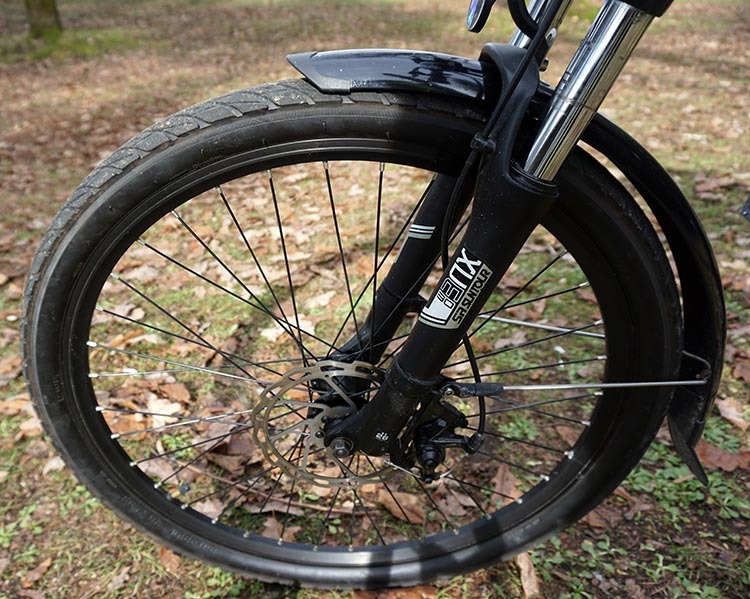 It has good strong tires that grip really well on mud, gravel, and any type of surface, so I felt confident that I would not slide out, no matter where I rode this e-bike. It also has disc brakes, which I think are essential on most e-bikes, to ensure precision braking despite the greater weight and faster speed. 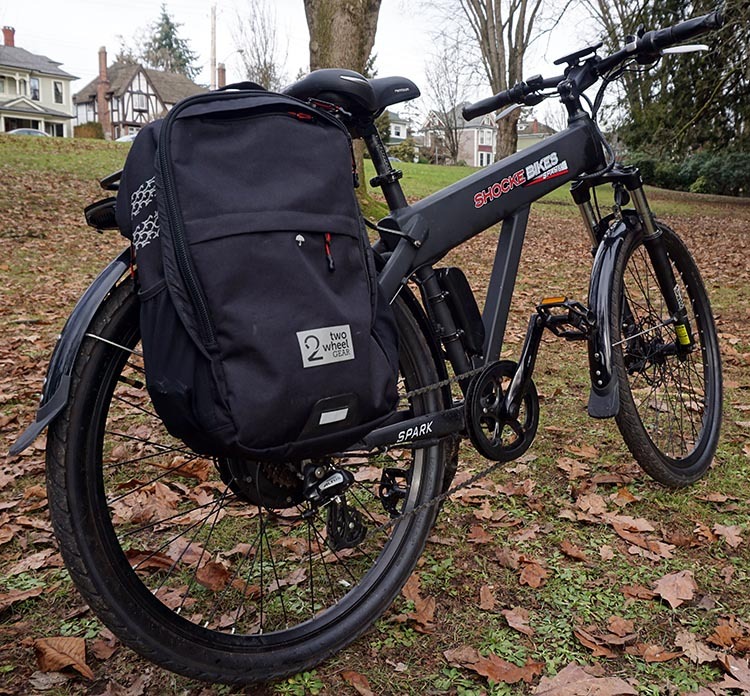 The Spark e-bike arrives fully loaded and ready for you to commute, thanks to having good lights, a strong rack, a VERY sturdy stand, and good fenders. By the way, I have had e-bikes that skimped on the stand, and it’s very unnerving. Most e-bikes weigh at least fifty pounds, so you want a strong stand to hold it up, and you do NOT want it falling on the dog! Check out all the specs and components of the Spark e-bike here! The fact that this electric bike has standard parts such as Shimano components, SR Suntour shocks and Zoom handlebars and seat is important. It means that you will be able to have this e-bike serviced and fixed at any regular bike store. Unless of course the problem is with the power system, but in my experience this is extremely rare with a good quality e-bike. These systems just don’t break down much. However, if it did, you would of course need a shop that specialized in e-bikes. The battery is concealed in the cross bar. I have always liked batteries in the cross bar, as I think they keep the weight nicely centered and balanced. I am sure the clever placement of the battery contributes to the balanced feel of this bike. In the video below, Ebrahim from Shocke Bikes describes the components of the Spark e-bike. I now wish I had seen this electric bike before I bought my last electric bike, because it cost a whole lot more money. As it was, I noticed Shocke when I saw their first Kick Starter (which I wrote about here). Since then I have met some of the guys from Shocke, and I find them to be a great crowd of people who believe in their products, and in their mission of bringing affordable, quality electric bikes to the market. 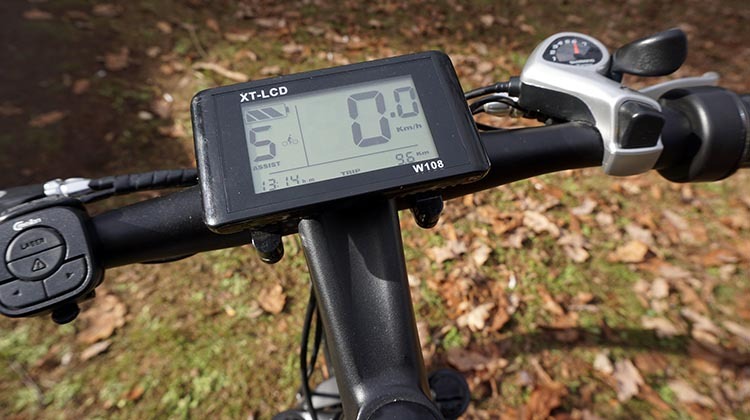 You control this e-bike with a small remote device next to your left thumb, and the system gives you information with a 3.7″ backlit LCD display console. Also on the handlebars is a device to wirelessly control the rear lights and turn signal (seen on the left of the photo below). On the console, you get information about what level of power assistance you are in, battery level, time of day, speed, and odometer. 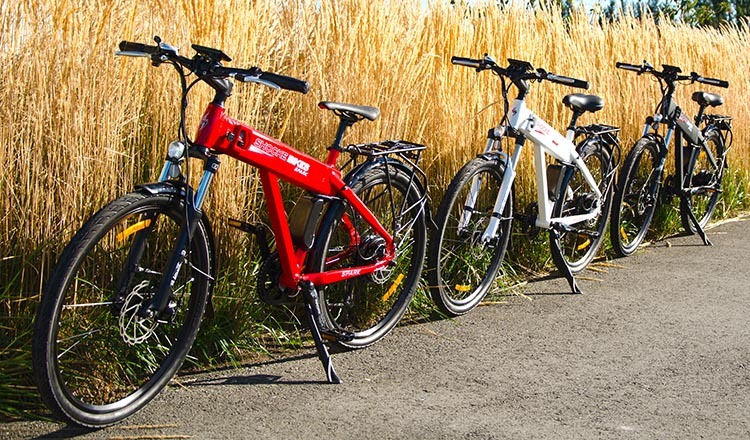 The bike offers you these options: use no power at all and just pedal; use just throttle power; or use one of the five levels of Pedelec assistance while pedaling. For the throttle, you simply twist your right hand back, like a motorcycle. It’s very handy to pull off on an uphill, as there is a two-second delay before Pedelec assistance kicks in. This two-second delay is a safety feature to prevent your bike suddenly rearing forward when you are stopped at a light, if you happen to rest your foot on a pedal. I have had that happen on other e-bikes, and it’s not fun at all. Here’s a video I made that shows how simple it is to control the Spark e-bike. Most of the time I used the Pedelec system to do my test riding. Pedelec systems either use a torque sensor or a cadence sensor. A torque sensor reacts to how hard you pedal, and adjusts accordingly. A cadence sensor simply reacts to whether or not you are pedaling. Once you start pedaling, there is a 2-second delay, and then the motor starts up. With a Pedelec system using a cadence sensor, the level of assistance is controlled by the level of assistance you have chosen on the console, not by how hard you are pedaling. Torque sensors are more advanced, and some people say they provide a more natural feel while cycling by mimicking your exertion level. However, I can honestly say that the assistance on this Shocke e-bike felt every bit as natural as the assistance on much more expensive bikes that use complex torque sensors for their Pedelec systems. Alternatively, you can coast along using only the throttle, even on uphills, as shown in the video further below that I took on one of my test rides. I did my first test ride of this e-bike off road and on road, starting off on a super steep hill. The riding position is somewhat hunched forward, about midway between an upright position and drop handlebars. This would suit a cyclist who likes an involved, intense kind of ride, reflecting the subtle aggressiveness of this e-bike’s design. Here’s my video of the test ride. The e-bike did really well! Notice in the video that after climbing three very steep blocks I was breathing heavily – enough to feel I had got some exercise, but not enough to feel uncomfortable. That sentence sums up in a nutshell why I love electric bikes – you get some exercise, but you don’t have to kill yourself. Also, of course, they make it possible for me to get up hills that I could not possibly bike up on a regular bike. Also note on the video that you can change the level of assistance with just your left thumb, as the controller is handily situated right next to your left hand. This Spark e-bike passed the acid test of getting me up my steep hill without too much discomfort, and of course, without the embarrassment of having to get off and push. I did have to pedal – Pedelec assistance absolutely requires pedaling. The minute you stop pedaling, the motor stops assisting. The notion that an electric bike is a free ride (like a motor cycle or a car) is just not true. Also, when the hills get really steep, you are going to have to help a LOT. On the other hand, you will go up minor hills like they are nothing at all, if you use a high level of assistance. Apart from having enough power to help me get me up steep hills, the other important factor for me in assessing an electric bike is this: Does it feel like a bike? By this I mean that I don’t want to ride something that feels heavy or unbalanced, as if I was driving a moped or a small motorcycle. It must have that light, well-balanced “bike” feeling that all good bikes have. It must feel nimble and light, so that I feel like an athlete (even though I’m really not). I had a lot of fun with the Spark e-bike in the park! This e-bike definitely passes that test. I rode it around a park, enjoying its responsiveness and its great cornering. It felt perfectly balanced, and I was easily able to ride it with no assistance, even on up-hills. You always want to have that option, in case your battery runs out. However, this bike has a claimed range of 44 miles (70 km), so you are not likely to ever run out of battery. That brings me to the power specs. The Spark electric bike has a 350 watt toothed, brushless, high-speed hub motor, powered by a 36 volts 11 amp hours lithium ion battery. As I mention in my book on How to Buy the Best Electric Bike, it’s best to have an e-bike setup in which the battery capacity in watt hours is equal to or greater than the motor capacity in watts. Watt hours = amp hours x volts. So in this case, you have a bike with a very generous 396 watt hrs in the battery, which should power that 350 watt motor for a very long time! To power up the battery, you use a key to remove it from the frame of the bike and then charge it with a dedicated charger. As with all electric bikes, a full charge takes several hours. The lights on this e-bike are superb, and are in fact the part of this electric bike that has my wife thinking of buying a Shocke electric bike for herself. The bike comes standard with front and rear lights. The front light runs off its own power and is switched on and off with a button, so that’s pretty standard. Where this bike really stands out from the pack is with its rear lights, which are unique to Shocke. First, the rear lights offer a laser option, which is essentially dual red lines that run behind the bike, warning any one coming up behind you that there is a bike ahead that is taking up a share of road space. You can have these lights steady or flashing. I would recommend using the flashing lights when sharing road space with motor vehicles. When on a separate bike path, you would be better with the steady light, as I think some cyclists would find these flashing lines on the road disturbing or distracting. Second, the rear lights also have remote wireless left and right turn signal indicators, which you can control with your left thumb on a wireless controller. This is a really great idea. There are so many times when I really need to signal a turn to a vehicle behind me, but I cannot let go of the handlebars if I am going downhill on a bike. These would be great in those situations, and really in most night-time cycling situations where you want to be as predictable as possible to other road users. I often get inquiries from readers about where to find an AFFORDABLE, quality e-bike, ready to commute with. This bike is the answer to that one! Overall, the Spark e-bike is a great commuter bike that you can ride on or off road. It is good looking without being flashy and overpowering, and includes many well thought out safety features, especially the lights. The Spark e-bike offers a great riding experience, whether you are cycling with no power for exercise and the sheer love of that cycling feeling, or whether you are using maximum power to get up really steep hills. Finally, the option of instant throttle power is excellent. I believe that the ability to get up to speed quickly is a big safety feature for those who cycle in mixed traffic. There are many traffic situations where you just need to get out of the way of buses and other large vehicles as quickly as possible once you leave an intersection, and you can do this much more easily if you are riding an electric bike with a throttle option. I would recommend this Spark electric bike to anyone wanting to get into the world of e-biking without breaking the bank! I would recommend this Spark e-bike to anyone wanting to get into the world of electric bikes without spending a fortune! 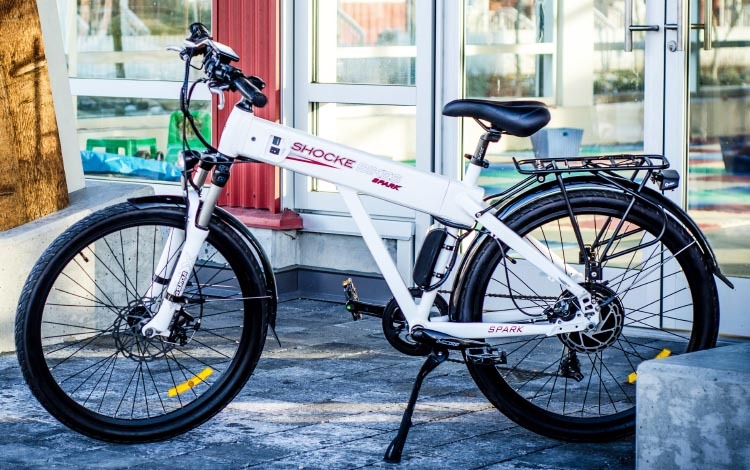 Find out more about Shocke e-bikes here! 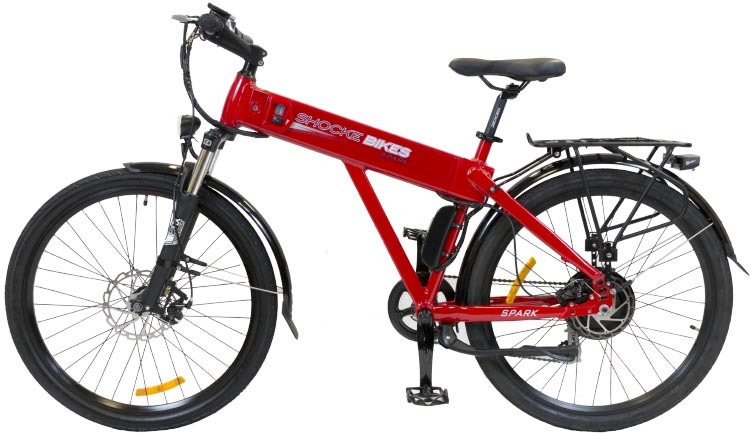 Find out more about Shocke electric bikes here!